The thymus lies in the chest behind the breastbone and above the heart. Relatively large in infancy, it increases in size until puberty and thereafter shrinks to only a few grams in old age. It consists of a framework of epithelial cells that house lymphocytes, the small round cells almost identical to the white cells in the blood. The lymphocytes that circulate in blood travel through the spleen and lymph nodes, and into the lymphatics that join up to form the main lymph duct that empties back into the blood. These cells were shown in the 1950s to be responsible for immune responses, such as producing antibodies and rejecting foreign tissue grafts. Thymus lymphocytes, however, could not recirculate nor take part in any immune reactions. Furthermore, surgical removal of the thymus (thymectomy) in adult mice was not associated with any subsequent immune defects. Hence, the thymus was deemed by immunologists to be a vestigial organ that had become redundant during evolution. Fig. 1. Stem cells (cells that can divide to produce more stem cells and differentiate into many specialized tissue cells) are produced in the bone marrow and circulate in the blood. Some get to the thymus where they produce the precursors of T cells that eventually go out to seed the spleen and lymph nodes and recirculate as cells able to fight infections and reject foreign grafts. Some stem cells differentiate within the bone marrow to antibody-forming precursor B cells that go out in the blood as B cells able to seed the spleen and lymph nodes and respond to antigen by producing antibodies. 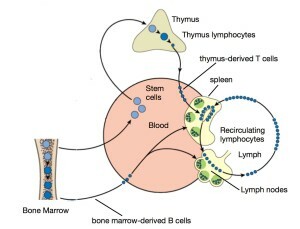 Both T and B cells are lymphocytes. Although these conclusions seemed justifiable, they were shown to be flawed by work done in 1958-1962, using a newly discovered thymic lymphoma virus in mice. This virus had to be given at birth for the disease to occur some months later. To test whether it could multiply in cells present only in neonatal thymus, thymectomy was performed immediately after birth and the virus injected soon after. It was expected that grafting a neonatal thymus 6 months later would not restore the potential for leukaemia development, unlike what had been observed in mice injected at birth, thymectomized at 6 weeks and thymus grafted as late as 7 months of age. However, the mice thymectomized at birth, although growing well whilst suckling their mothers, subsequently wasted and many died. 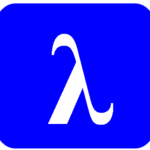 Autopsies revealed low lymphocyte levels and lesions suggestive of intercurrent infection. 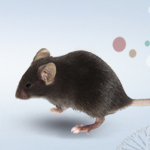 Testing these mice, prior to wasting, for antibody production and foreign graft rejection, showed severe defects in immune capabilities. It was thus concluded that the thymus in early life manufactures lymphocytes that eventually seed the circulation and respond immunologically (Fig. 1.). Fig. 2. Fragments from tumor cells that may produce nonself antigens are taken up by dendritic cells and presented in the jaws of the MHC molecules to specific T cells that bind the processed fragments (blue circle) through their TCR. As a result of this binding, the T cells produce costimulator molecules (CD28) that bind to the CD80 molecule on the dendritic cells. CD28 then acts in concert with the TCR to enable T cells to respond immunologically by acting as tumor specific killer cells and to multiply. Later in the response the T cells produces checkpoint inhibitor molecules CTLA-4 and PD-1 to curtail the response and prevent further multiplication. Melanoma tumor cells have been shown to produce a molecule called PD-L1 that bind to PD-1 on the T cells and inhibit these from any response against the tumor. They also recruit Treg cells that prevent the killer T cells from acting. 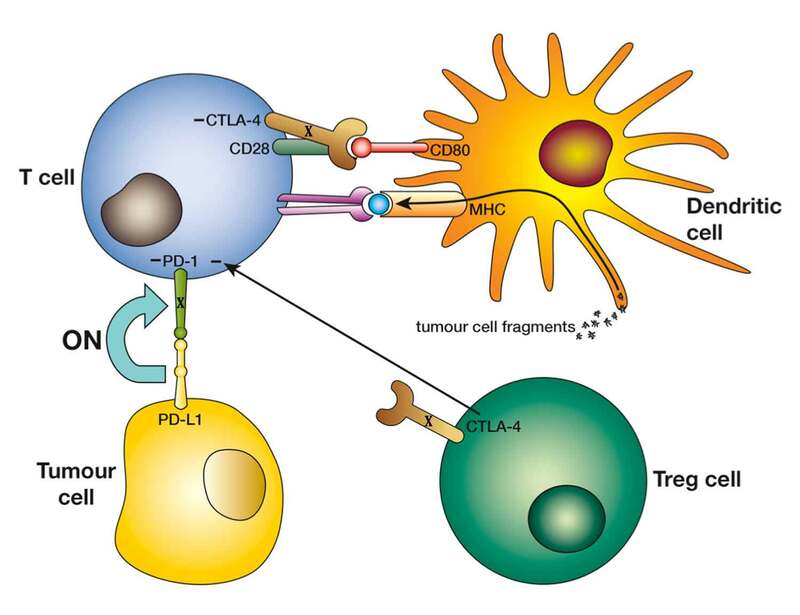 By producing antibodies (shown as X) against the checkpoint molecules CTLA-4 and PD-1, the killer T cells have been released from inhibition by PD-L1 and Treg cells, and thus have successfully killed the tumor cells. 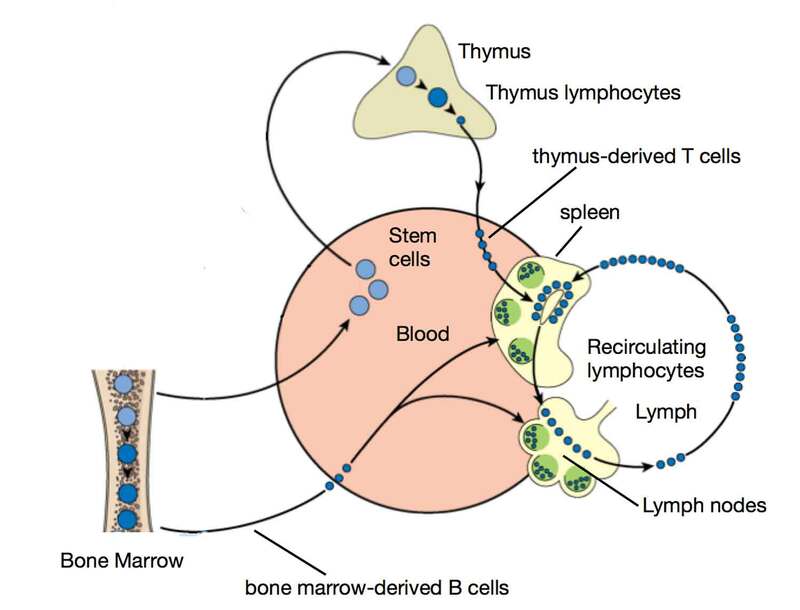 Further work showed that circulating lymphocytes comprised two types: ‘B cells’ derived from bone marrow produced antibodies, and ‘T cells’ from the thymus interacted with them to help them do this. T cells were also involved in other immune reactions such as fighting virus infections and rejecting foreign grafts. But T cells made in the thymus and recognizing the body’s own tissues (self-reactive T cells) were either killed intrathymically or prevented from responding by other cells called Tregs. 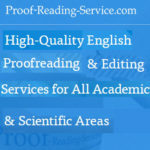 Defects in the removal of self-reactive T cells accounted for allergies and autoimmune disease such as diabetes and multiple sclerosis. 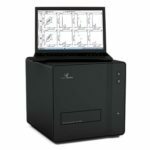 Numerous molecular investigations followed. T cells failed to see naked antigen – it had to be presented through antigen-presenting cells such as dendritic cells. Once seen by the T cell receptor for antigen (TCR), the T cells produced “co-stimulator” molecules that acted in concert with the TCR to enable the T cell to multiply and exert its function. Later in the response, “check-point inhibitor” molecules (CTLA-4 and PD-1) were produced to prevent T cells from multiplying indefinitely (Fig. 2.). Antigens expressed by cancers arising spontaneously from normal tissues are expected to be self-antigens, and hence not recognized by T cells. Nevertheless evidence obtained in neonatally thymectomized mice suggested that T cells could prevent cancers from arising. Furthermore, some tumors, notably melanomas, with a high mutation rate might generate non-self antigens and yet were not killed by infiltrating T cells. This suggested that tumor cells produced molecules constantly inducing checkpoint inhibition of T cells or recruiting inhibiting Tregs. Antibodies to CTLA-4 and PD-1 were therefore made to enable the release of tumor-infiltrating T cells from checkpoint inhibition. They have had spectacular success in curing some melanomas. Another technique, based on gene transfer technology targeting the patient’s own T cells to tumor antigens, was effective in curing some lymphomas. T cell-tumor immunotherapy has therefore come of age. The journey from discoveries in fundamental immunology to cancer immunotherapy.